Sweet! Keep us posted, mine is only a 700, but would be interested in a full system to replace my micron slip on. damn why does everyone want my money?? 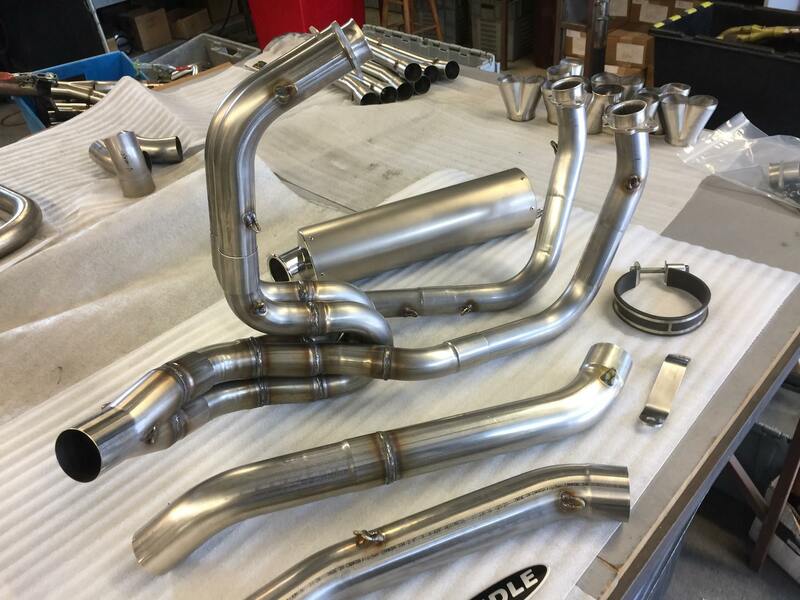 Looks almost like the factory racing pipes of the 80's , made of about 400 small pieces beautifully hand-welded and shaped. How about posting the dyno curves on that run, evl - t ??????????? ......seems that alot of 4into1s need extra carb tuning to get rid of a flat spot in the 4500-5500 range ? Hindle has always been really nice stuff. correct me if i'm wrong, but i think the engine needs to almost come out of the frame to install the rear headers ! I don't think we'll have to worry about that. Unlike the originals, it's a 4-2-1. The front pipes Y right after they pass the rear pipes, and I gather the rear pipes Y right after turning rearward, right below the front Y. They're beautiful though. Looking forward to a sound clip and a price! 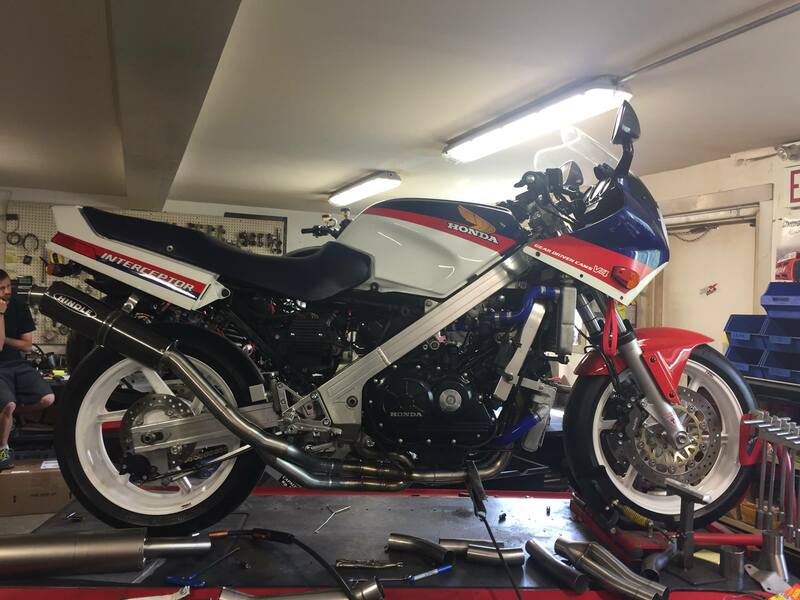 Evl_twin-- Do you know anything about the VFR in your pics? What's up with the second radiator?? Does anyone with an 8th gen live close to them? Maybe have them take a look and see how close/far the 86/87 system fit would be for an 8th gen (and how much $ it might be to make a system for an 8th gen or modify the 86/87 to fit the 8th)? In My Garage::In my garage won,t take it!!!!!!!!!!!! Too much to list. Not quite, on those models the rear headers pass between the swingarm pivot & the engine. There is not a lot of room, but they can be done insitu, its a right old fiddle. It's simple to pull the swingarm out & then you have easy access ! I like the layout of that, the split feed front headers is a great idea ! 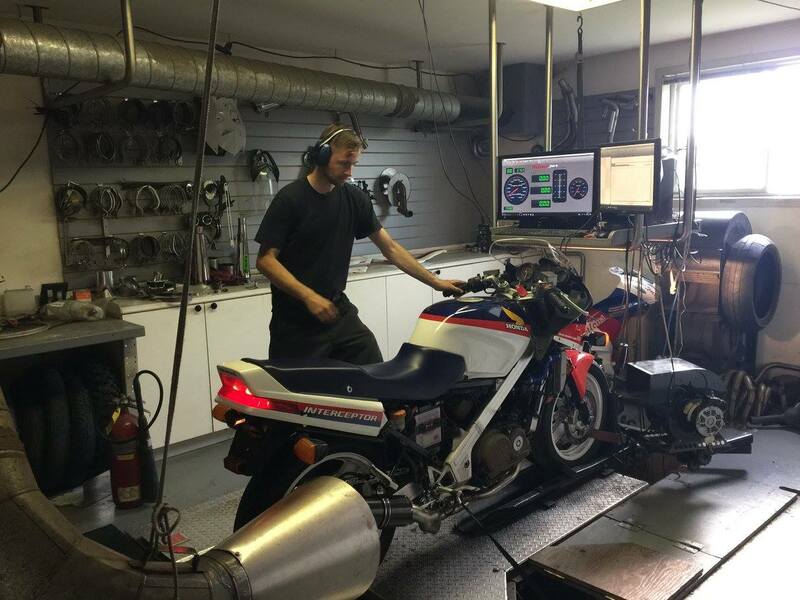 It is probably the vfr400r setup, you can buy those twin rads pretty cheap on ebay and they fit with little fuss. Some kits come with hoses, but i think samco makes a baller silicon hose kit if you're lookin for top notch quality. Just got an email, they're going into production! They're available in low mount and high mount (requires removal of rear peg mounts). Full 4-2-1 stainless system with stainless can for only $998 Canadian in low mount, high mount is an additional $50 with bracket. Carbon can is an extra $75, Titanium can $50 extra. They offer three can lengths, 14", 16" and18". No cost difference between the different lengths. Not sure how long these are going to be available, so if you want one get one now! That sure looks fabulous. I went to their website to look for fifth gen applications. I did not see any. And as I thought of emailing them to see if they had any plans for one, my wallet screamed bloody murder. So I had to pass on the temptation. I will say that the price looks rather reasonable compared to others I've seen. Is that the 18" in the bottom picture? I like your choice, may wait to see it, but a low 16" carbon may be my choice. I couldn't find anything on the VFR on their website, how do you put a deposit down? Is it not listed on their website yet? $759 US plus shipping, I have to many projects going on to do this, but I want it so bad. do we know if it will be a continued part that they will have available for a while or a limited time only thing? SamW, that does look like the 18" in the bottom pic. Right now on my 86 I have a Yosh 4-2-1 half system/slip on which has a 15" can, the 16" made the most sense to me. It also depends on how loud you want (or don't want) it to be, he did say the 14" was the loudest. well I just emailed them, inquired about a 14" high mount in titanium wtf if I am going to over spend on this thing I might as well got full retard on the thing.. I have a left exit TBR waiting to go on my 1990 vfr so this just makes sense to me lol. now for someone to make something for the 6gen and I will be good to go. I called them last December and they told me they are not making an exhast for my 85VF- 1000r , seems like they are on the way there after all! Well at least the first step any way, beautiful work though!$1000 cheap for what you getting! 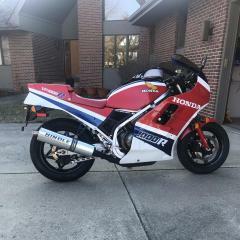 I am struggling too, $800 exhaust for my '86 bike with 90k+ miles on it, I guess it already worth more in parts. I will contact them and get on the list. On the other hand, I recently bought a used Hindle on eBay for $275, but to compare it to a new one, it needs to be shined up a lot, the 2 bottom pipes un-crushed, a new can and a new pipe between the collector and the can! In the end it'll cost as much as new (maybe more! ), plus take me a lot of effort. 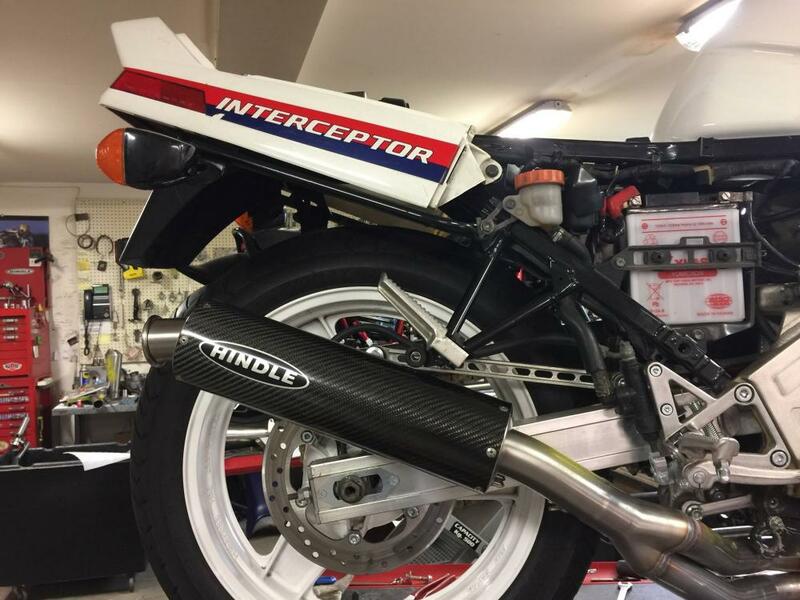 The good news for me is, mine's a 4-into-1, while this new one is a 4-2-1, and I think the 4-into-1 sounds a lot better (comparing another 4-1 Hindle I used to have to the HRC pipe my friend had).